It was sent to me by a friend and it was a video of her young dog starting bitework. Normally, I keep my opinions to myself. I live by my own personal Golden Rule of “don’t give advice unless it’s asked for.” But here, she asked. And I was happy she did. I could tell she was taken aback. I think everyone wants to think of their dog as confident and tough. And more than that, I think everyone wants to believe they know what their dog is thinking or feeling. And I could tell she felt a little struck that she hadn’t caught it. Dogs are masters at body language. They can catch subtle changes in our posture, expression, and even our breathing. And they pick up messages from those changes. Messages we may not even realize we are sending. ….all we have to do is listen. If your dog participates in bitework, or if you are simply playing a rousing game of tug, by paying attention to their body language, you can tell if they are confident and having fun, or if they might be feeling a bit conflicted. …And it starts with the ears. The ears are tiny radars that point in the direction of whatever it is the dog is paying attention to at any given moment. Slicked back to the head while biting or tugging (how much your dog is able to slick back their ears is dependent on the breed – my bloodhound doesn’t slick her ears back like my Malinois does!) means the dog is fully committed. They aren’t paying attention to anything in the environment. They are all in. But as soon as those ears perk up, it’s a clear indicator that something is competing for their attention. They are worried about something in their environment. And they aren’t feeling sure about their bite or tug work. Here’s a photo of a dog that’s feeling apprehensive. Check out his ears. He’s clearly worried about the work that’s happening. And here’s one of a dog that’s all in. See the difference? Here are a couple more of dogs that are playing tug. This dog is feeling worried. 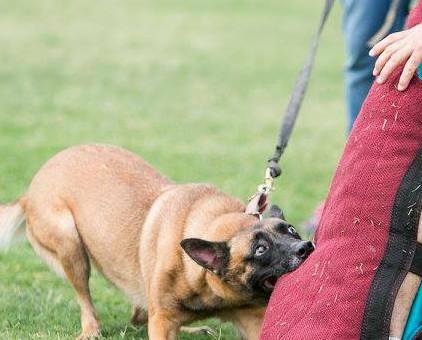 Dog trainer, Meagan Karnes plays tug with Malinois in grass. This dog is all in. 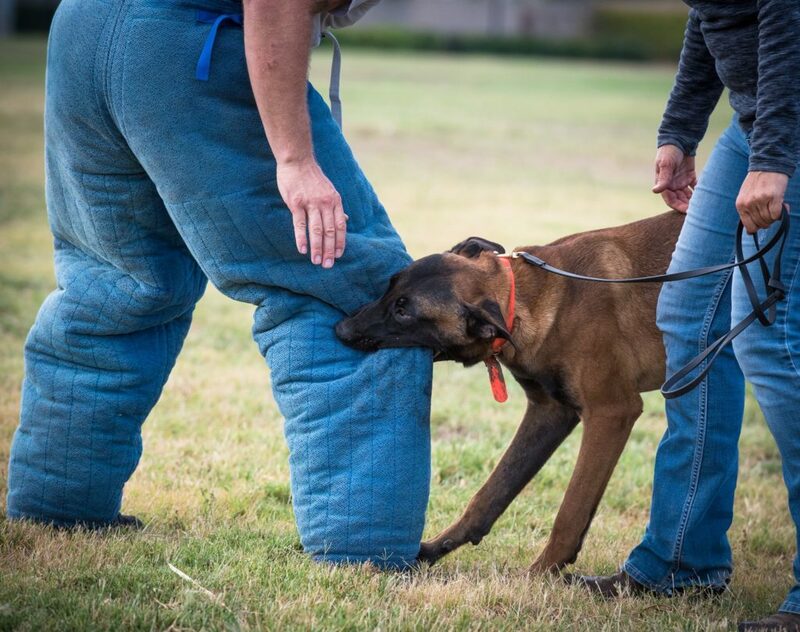 Remember, not all dogs will be able to slick back their ears as tightly as my Malinois – so get to know your particular dog when forming an assessment. There are also a few other key factors to pay attention to, that will tell you if your dog is feeling confident or might be a little stressed. Eyes – If the eyes are big and wide, and especially if you can see the whites, your dog is feeling stressed or apprehensive. Look for a relaxed eye to know your dog is confident and secure. Eyebrows – If your dog’s eyebrows seemed furrowed or tense, your dog is a little worried about the game they are playing. If your dog is growling or vocalizing on the bite or during tug – Some dogs are more vocal than others. But vocalizing on the bite or while tugging isn’t a sign that the dog is loving the game. Rather, it’s an indication that they are mismanaging their stress, getting hyper-stimulated, or or they are feeling conflicted or insecure. 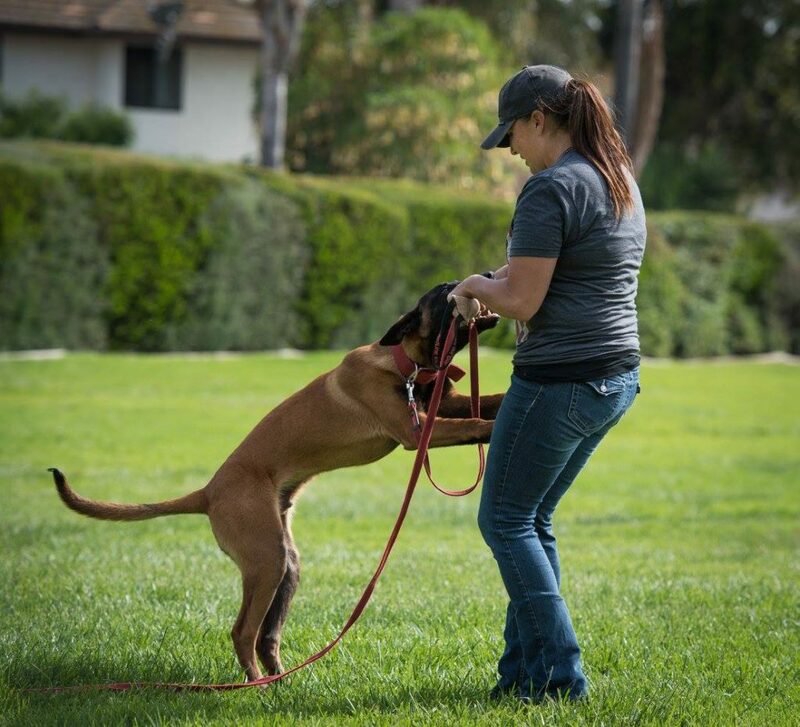 If your dog vocalizes during bitework, check for other body language cues to make an assessment as to whether the vocalization comes form a place of insecurity or not. 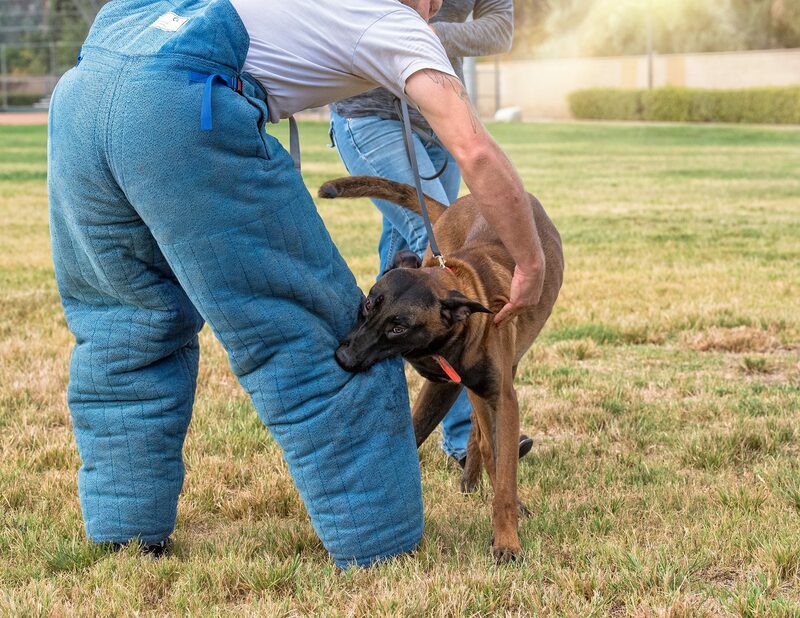 And if you are training for sport, and your dog vocalizes but seems secure, calming them and minimizing growling will undoubtedly help you in the points department. If your dog is pulling back hard – Some dogs pull back because this is what they are taught. Some people prefer dogs to pull back in bitework and in tug games. But if your dog is pulling back hard while displaying any of the above body language cues, it’s a clear sign they are feeling stressed about the work that’s happening. 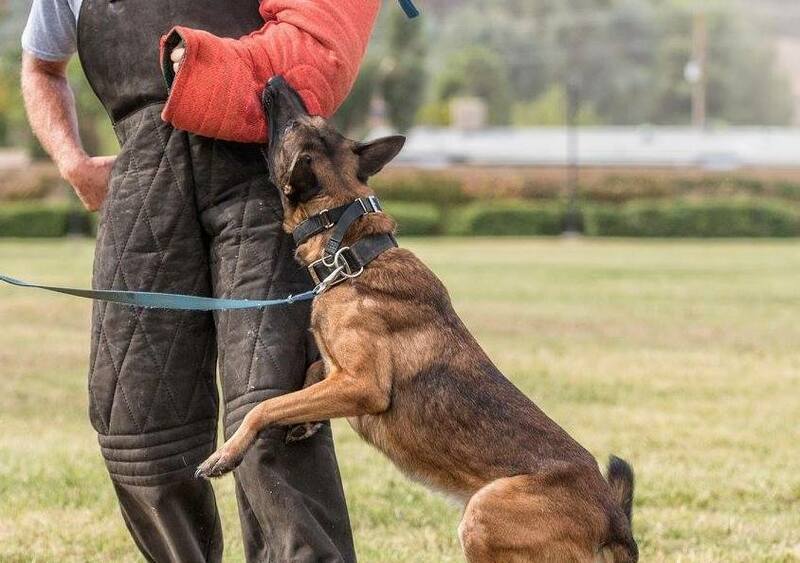 Malinois bites onto bitework suit while looking up at decoy. Look at the eyes, ears, and body position. This dog is clearly uncomfortable. And just a heads up, stress can come from a number of things. It could be that there is too much pressure and movement, or it could be that there isn’t enough. It could be that your dog feels conflicted about the work, and it could come from a simple lack of clarity. Maybe you changed the game and the dog doesn’t understand. 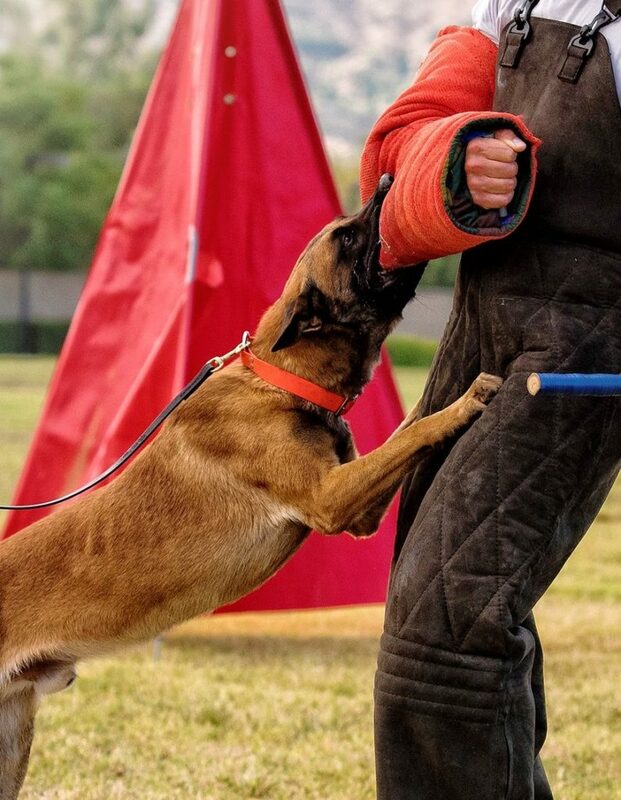 Malinois on leash jumping up and biting onto arm bite sleeve during Bitework exercise. Now check out this photo of a dog that’s all in. It’s up to you (and you’re decoy/helper if you’re doing bitework) to determine why your dog is feeling stressed, and what you need to do about it. By paying attention to body cues, we can gauge how our dog is feeling when they are playing tug or practicing bitework. If you find your dog is regularly feeling stressed in bitework, have a chat with your decoy or helper about what you can do to bring his or her confidence up. And if your dog displays signs of stress while tugging, calm your game, or relieve some of the pressure to help them feel more secure. By listening to the messages your dog’s body language is sending, you can adjust your training and handling to ensure you are supporting them, and are giving them positive, confidence-building experiences. Photos compliments of Tamandra Michaels of Heart Dog Studio. Some photos have been cropped to suit this article. 5 replies to "Missed Messages: Is Your Dog Feeling Secure in Bitework or Tug Play?" Awesome feedback… made me go back and review my recent videos that I posted to the group!! The female looks really confident and comfortable working… but the male looks maybe a little unsure of himself!! I’m going to video more trainings, especially while doing bitework!! The male is the one that I’m a little more concerned with and trying to make more confident !! Very interesting! When Ame did bite work, her ears were down. They really petted her and said Good girl. Tug, many times the ears are up, but it is before she gets the tug. Once the tug is in her mouth she is all in.. Shot Lure Coursing.. ears slicked back.. she is all in… You pointed to something that I never really considered.. Thanks! Valuable material in videos. Would love to be able to PRINT slides.